When young Tenar is chosen as high priestess to the ancient and nameless Powers of the Earth, everything is taken away - home, family, possessions, even her name. For she is now Arha, the Eaten One, guardian of the ominous Tombs of Atuan. While she is learning her way through the dark labyrinth, a young wizard, Ged, comes to steal the Tombs' greatest hidden treasure, the Ring of Erreth-Akbe. But Ged also brings with him the light of magic, and together, he and Tenar escape from the darkness that has become her domain. "Come home, Tenar! Come home!" In the deep valley, in the twilight, the apple trees were on the eve of blossoming; here and there among the shadowed boughs one flower had opened early, rose and white, like a faint star. Down the orchard aisles, in the thick, new, wet grass, a little girl ran for the joy of running; hearing the call she did not come at once, but made a long circle before she turned her face toward home. The mother waiting in the doorway of the hut, with the firelight behind her, watched the tiny figure running and bobbing like a bit of thistledown blown over the darkening grass beneath the trees." When I was a school boy in England, many moons ago, I read Le Guin's A Wizard of Earthsea. It made a lasting impression on me (as it did Neil Gaiman, as he writes HERE.) But, I had never gone ahead and read the other books in the series. When Le Guin died earlier this year, I decided to put that to rights. Ged Sparrowhawk, the protagonist of A Wizard of Earthsea, makes an appearance in this book, but the main focus is on Tenar, renamed Arha, The Eaten One, when she becomes the One Priestess of the Tombs of Atuan. Le Guin's world building is tremendous. Her father was a well-known anthropologist, and his interest in the study of humankind obviously made its way to his daughter. The search for a new priestess upon the death of a preceding one reminded me of the Tibetan belief in reincarnation, and the search for the new child born upon the death of a Dalai Lama. Poignantly, the carefree child with whom the novel opens, is taken at age five for training in a desert compound near the tombs. Her training is severe, and she becomes hardened and hardhearted. But, even in this dark place, a shard of her former self remains. So, when she spies Ged hunting for the Ring of Erreth-Akbe in the tombs, curiosity gets the better of her. As she gets to know him, she begins to doubt what she has been told about her life as the One Priestess. She and Ged escape. The theme of the novel might be that of a girl coming into the knowledge of her true power. In an Afterword written forty years after the book was published, Le Guin writes: "Maybe it was the whole primitive, hateful idea of the feminine as dark, blind, weak, and evil that I saw shaking itself to pieces, imploding, crumbling into wreckage on a desert ground. And I rejoiced to see it fall. I still do." 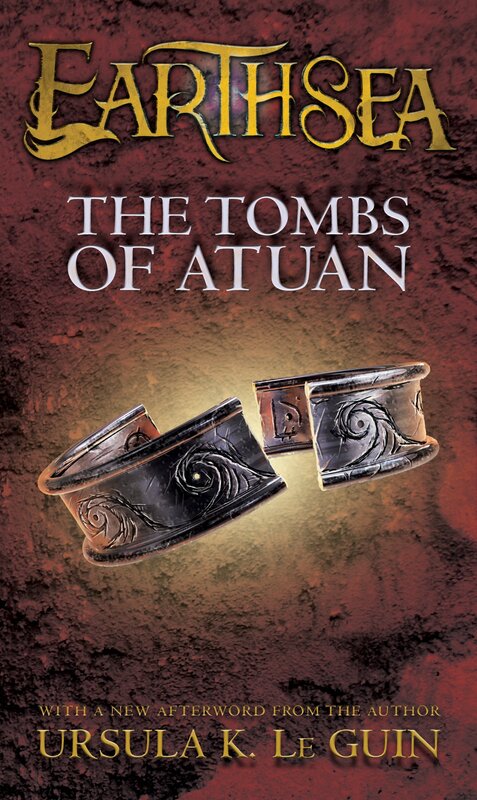 A woman friend of mine told me recently that when she read the Tombs of Atuan when she was twelve, it was transformative. Ursula Le Guin's writing will do that to you! 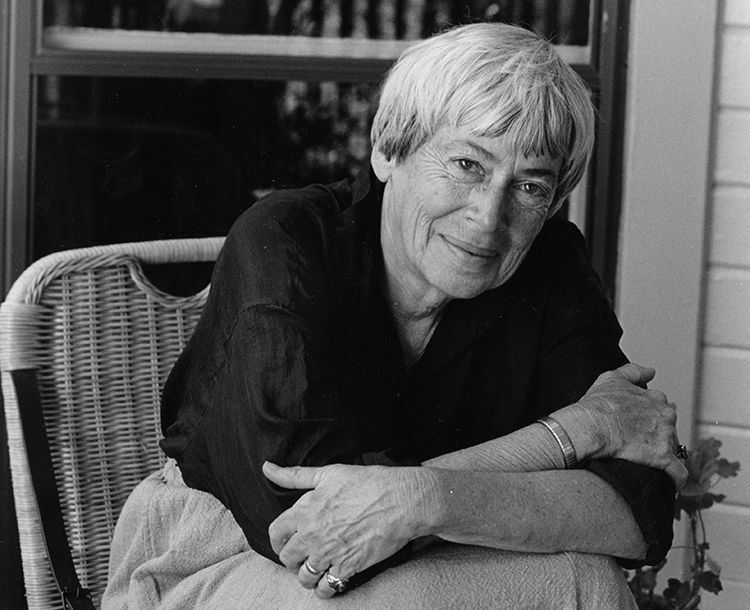 Ursula K. Le Guin was born in 1929 in Berkeley, California. She published twenty-two novels, eleven volumes of short stories, four collections of essays, twelve books for children, six volumes of poetry and four of translation, and received many awards: Hugo, Nebula, National Book Award, PEN-Malamud, etc. A long-time resident of Portland, Oregon, Le Guin died on January 22nd, 2018. Sophie Kinsella is a bestselling author from Britain--if you read adult literature she has a well-known series: Shopaholic. Now she's written her first book for children, and it's a fun and frothy confection starring fairies. Once the mafiosi got past the glaring pink cover, we enjoyed it immensely. Ella Brook can't wait to grow up, because one day she will become a fairy and have her own sparkly wings and a teacher on Fairy Tube, just like her mom! Until then, Ella has to watch her mom in action. But sometimes spells go wrong, and Ella's mom can never seem to remember the right magic codes. A lot of the time it's up to Ella to come to the rescue. Does she have what it takes to be a fairy one day? Or will there be more glitches than glitter? 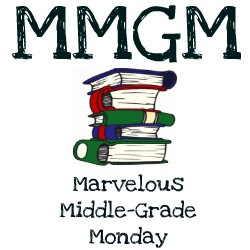 Filled with Sophie Kinsella's sparkling humor and Marta Kissi's charming illustrations, Fairy Mom and Me is a story about a savvy girl, her imperfect mom, and a little bit of magic. "Hi there. My name is Ella Brook, and I live in a town called Cherrywood. I have blue eyes and brown hair. My best friends at school are Tom and Lenka. My worst enemy is Zoe. She lives next door and she's my Not-Best Friend. She looks mean even when she smiles. You'll meet them all later." There's not a huge amount of character development, but that's not the strength of stories like this. It's all in the crazy mayhem that ensues when fairies try to clean house, or get fed up standing in line at the grocery store. Frenemy Zoe is an out-and-out villain, and little brother Ollie is a one-man wrecking machine. The illustrations are super, and this is a quick read which would be perfect for 2nd-4th graders. The good news: there is a book 2 in the pipeline: Fairy In Waiting! Also, in late January, Lambur Productions announced it had optioned the book for a live-action television series!!! A modern-day Bewitched, maybe?! This terrific novel is on the Oregon Battle of the Books list. Sadly, my son's team was knocked out in the third round, so we may be moving on to other reading lists. He is doing a project on it, however, in his 5th grade class, the requirement being that the project be on an honor-winning book. 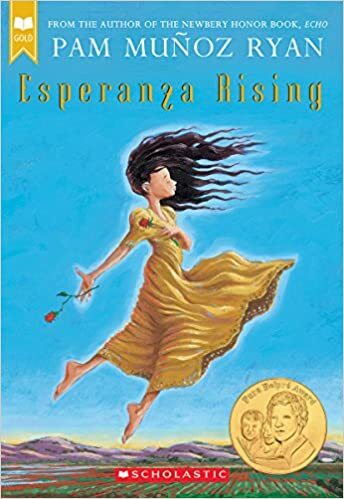 Esperanza Rising won the Pura Belpre award in 2002. "Our land is alive, Esperanza," said Papa, taking her small hand as they walked through the gentle slopes of the vineyard. Leafy green vines draped the arbors and the grapes were ready to drop. Esperanza was six years old and loved to walk with her papa through the winding rows, gazing up at him and watching his eyes dance with love for the land." In some ways, this is a difficult book to read, especially for the tender-hearted reader. My son has some anxiety around the subject of death, and the novel starts with a significant death. We got through that carefully, and then voyaged with Esperanza as she headed north to the United States. Esperanza is a complicated character. She has been brought up with wealth and servants, and now finds herself working in a camp for Mexican farm workers. She comes across as spoiled and petulant initially, but the experience she undergoes opens her eyes to the concerns of others. Esperanza Rising is deftly plotted, and the relationships between characters are skilfully drawn. I thought the book was touching. I learned that you have to adjust to other people. My favorite quote was "Don't be afraid to start over."